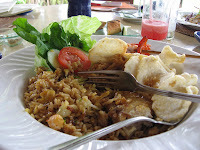 Food included the ubiquitous Nasi Goreng (recipe here) which is fried rice made with local spices and mixed with chicken or seafood. Then there was Ikan Bakar which is prepared from a 5kg Padi padi fish, marinated in the chef's special spices and oven-baked in foil to keep its full taste. 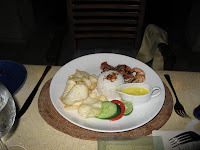 This is then served from a carving trolley in portions with a selection of rice and sambals and Lombok's famous kangkung (water spinach). We tried the Mongolian barbeque one night; you can select from many meats (I remember livers of lamb & chicken, chicken breasts, baby octopus, squid, salmon, and tuna), many different vegetables, a variety of noodles, and have the chef stir-fly your selection in a wok in your choice of sauce. 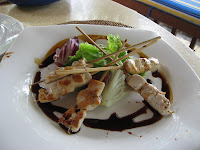 We also savoured the Jimbaran-style seafood barbeque with a variety of seafood and fresh fish, marinated in the Jimbaran way before being grilled on coconut husks and served on rattan plates with banana leaves. All of this on the beach-front under a bright moonlit night, as the songs sung by the quartet of musicians from Sumatra mixed with the roar of the crashing waves nearby. But it was the desserts that were really, really good! 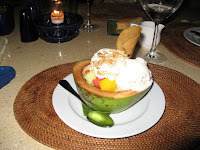 Every one of them... From the flambed mango and kiwi in bali moon liquor, the heavenly fruit gratin made with the freshest fruit and then gratined with a thin crust, to the fruit medley in bali moon liquor and fresh whipped cream which was served with coconut ice-cream (see pic).